Ultrasound Fat Cavitation is the latest revolution in fat removal technology that does NOT involve medical intervention or surgery. But what is it exactly? The scientifically developed medical Ultrasonic RF technology is based on a medical breakthrough that uses biocavitational ultrasound waves and radio frequency energy, to selectively break down fat cells without affecting neighbouring organs and cells. Immediately after treatment, your body clears away the disrupted fat cells, mainly through the liver. As the fat cell membrane cannot withstand this pressure, it will explode into the liquid content. After disruption of adipose cells (fat cells), the broken fat in the form of triglycerides is released into the interstitial fluid between the cells, where they are enzymatically metabolized to glycerol and free fatty acids. Water soluble glycerol is absorbed by the circulatory system and used as the energy source, whereas the insoluble free fatty acids are transported to the liver and processed as fatty acids from food and are expelled via the urinary system. Generally one cavitation treatment lasts for 40 minutes, where a single part of the body is treated: abdomen, buttocks, internal or external part of the legs are the most common ones. 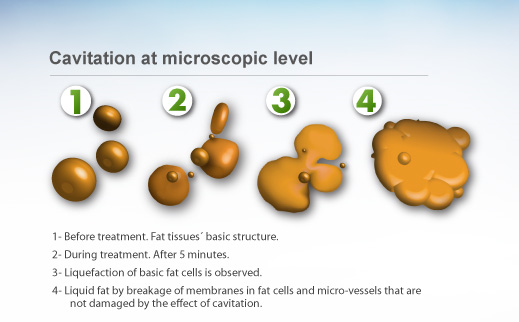 A cavitation session will result in an immediate loss of 3-7 cm from the area treated, from the first session.